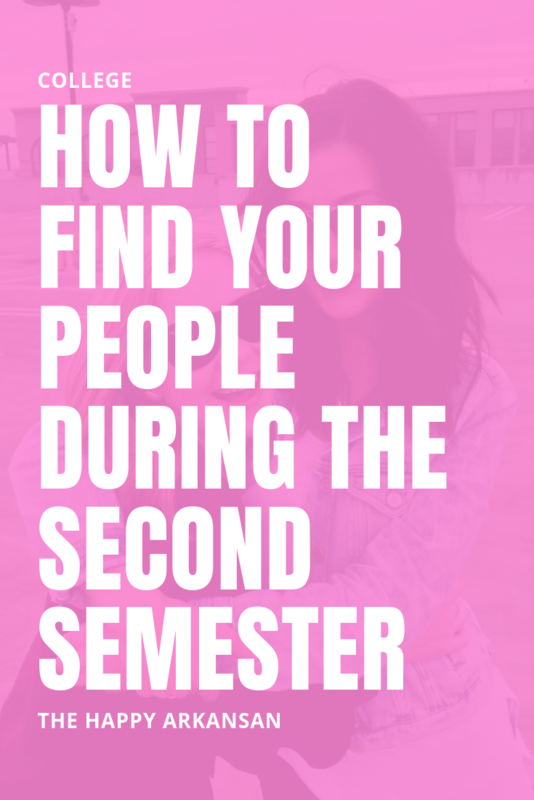 Last year, I shared a post all about how to find your people during college. I wanted to create a follow-up to that post because I understand that it takes certain people longer to find their people. I wanted to let you all know, that you can find the people who matter most to you during your second semester. It doesn’t always happen at first, but that doesn’t mean that it will never happen. I hope that this article will help ease your tension about finding friends going into the second semester, and I also hope that it will provide some direction for you as you get ready to tackle spring semester in a few weeks. Let me be clear, I am not going to give you advice: “go to all the campus parties, smoke, drink, and have a grand old time!” I never met any of my friends from college at a party. I went to a handful of parties with friends, but I never met a friend at one. I’m not saying that you can’t meet friends at parties, but I wanted to give that brief caveat because I know that if you are reading this you are probably rather shy or introverted at your school and the party scene may not be for you. I get you, the party scene wasn’t for me either, but I managed to make many friends throughout college and graduate school. Before we begin the journey to finding you more friends during the spring semester, we have to evaluate what you did during the fall semester. How did you go about trying to make friends? What are all the things that you did deliberately to make a friend, and how long did you try out these tactics. Be honest with yourself here. It’s so easy to say that we tried to make friends, only to realize that we gave up very early in the process of making friends. Making friends takes time, energy, and effort. It doesn’t happen overnight. Sure, some friends are easier to make than others, but overall, you need to put a lot of energy into making friends. Take out a sheet of paper right now and go through your fall semester in your head. What did you do and how many times did you do it? For example, students are often told to keep their dorm room door open so that people who are passing by may pop in and see what they are doing. But, if you think back to your fall semester and you only did that two times, you didn’t truly give that method your all. You may want to try to do some of the methods you tried again. Make a special section for the things that worked. If something worked and you made a friend from that activity, you may want to try it again your second semester. If you have connected with very few people, it’s easy to say that people who already have friends don’t want more friends. I am not going to repeat that because it was hella rude, but you get the gist. Some people are amazing at juggling multiple friends. They manage to have a million different friends, but when they are with you, it’s like you are their only friend. Now, I have never been one of those people. I keep a small set of friends, and I can’t manage to keep up with more than a handful at one time. It’s kinda one of my poor traits. Just because I can’t balance multiple friends, doesn’t mean other people can’t. Even I have made friends at various stages of my life. Other people want to make friends, like all the time. It doesn’t matter if it’s their freshman year of college or their senior year. People are always down to make new friends. Stop psyching yourself out by telling yourself that everyone already has a friend group, so they wouldn’t want to be friends with another person. There are plenty of people that want to be friends with you! Life is SO much easier in your comfort zone. It is so easy to do the things that make us feel comfortable, but there is a tradeoff that you make when you value easy and comfortable. The tradeoff you make is often growth. Your comfort zone isn’t meant for growth. It’s meant to keep you stagnant, in the same place, and stable. Now, I am not telling you to live your entire life outside of your comfort zone. No one truly lives their entire life outside of their comfort zone. It’s hard and uncomfortable to do that. Making friends doesn’t require a 24/7 out of your comfort zone experience. Every once and a while, though, you will need to leave the safe cocoon of your comfort zone. If you are not willing to take a few steps out of your comfort zone every blue moon, making friends in college will be more difficult. We all have a ton of places in our college that we don’t hang out in much. There were many places on my college and graduate school campus that I never set one foot in. Chances are, you have a small set of buildings that you go to on a day-to-day basis, and the rest of the buildings on campus are completely foreign to you. When you hang out in new spaces, you have the chance to meet new people. Your college campus is bigger than you think, so if you take the time to hang out in new spaces, you will meet people that you have never met before. The people that you meet may not have as much in common with you because their majors will likely be quite different, but opposites seem to attract in friend groups and relationships, so don’t be afraid to reach out. In college and graduate school, I met some of my best and favorite people in the classroom. The classroom creates a great environment for you to get to know people, their opinions about various topics, and it creates many great scenarios for you to hang out outside of class/talk before and after class. All you need to do is say something. Sometimes, you will get lucky, and the person will approach you first. If they don’t—work up some of that out of your comfort zone courage we talked about earlier, and say hi to your classmates. Complain/talk about the homework, introduce yourself to your classmates, and even compliment them on something they are wearing if that’s all you can muster. In my experience, some of the best friendships in the world are started in the classroom. Clubs and organizations were my thing in college. I loved getting involved in extracurricular activities. There were SO many clubs to join in college that it was almost overwhelming, but it’s all about finding 2-3 that speak to you. If you ever have any questions about joining a sorority, don’t hesitate to email me and let me know. You can find my information on the contact me page! I am always open to having a chat about all things sorority with any of my followers. Academic organizations are also a great way to get to know professors in your department because they often play a big role in the academic organization’s meetings and activities. I loved being a part of academic organizations because they usually required less work than my sorority, but I still got a lot out of going to the meetings and being involved. Chances are your university has tons of hobby-related groups on campus. There are hundreds if not thousands of people who go to your university, and they all have different likes and dislikes. There is a big opportunity for you to find people you have even one thing in common with be it a religion, a political affiliation, a love of Harry Potter references, or a fascination with board games. Get to know the wide array of people who attend your school, and get to know them through a hobby that you share. This, like academic organizations, gives you a built-in thing to talk about and bond over in and outside of meetings. Honestly, coworkers are the best friends you could ever have! You have something in common and normally you are working with at least one other person for an extended period of time. In that time, you don’t just stay silent! You build a working relationship with the people that you work side-by-side with each day. Not only would getting a job allow you to meet new people, but it would also allow you to make some extra cash at the same time! So, I would encourage you to check out the student jobs section of your campus website to see what kind of jobs your school has available for you. Getting to know new people is tough, I get it. I am about as introverted as they come. Good things come to those who step out of their comfort zone, and what do you have to lose? Probably not much, but you have a whole lot to gain from finding your people in college. If you have zero or very few friends, you can’t get lonelier—you can only get happier from here. So, get out of your own way, make some new friends, and just get out there, girl!